When researching what to do in Seattle the first thing that popped to mind was the EMP Museum. The main reason being that they recently opened a new “Fantasy” section complete with costumes from Princess Bride, Labyrinth & a throne from the Game of Thrones TV show. Since I had seen most of these shows I knew this was something I definitely wanted to see. 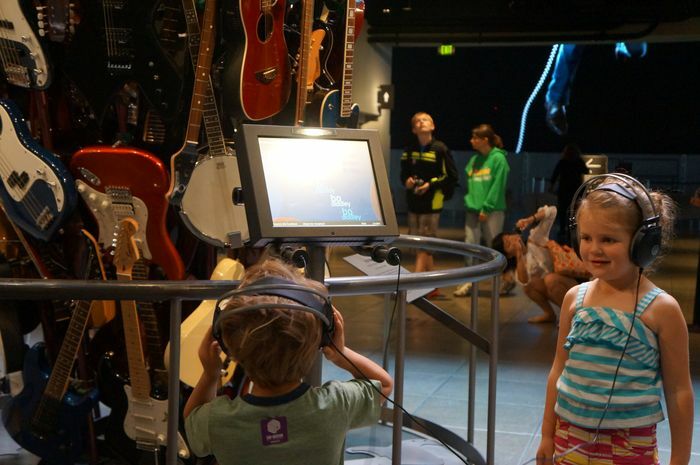 My husband is also a musician so he wanted to check out the music side of things and the interactive Music Lab is supposed to be a big hit with kids. 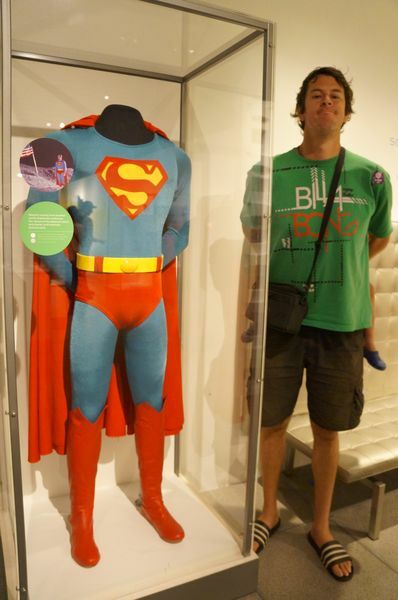 However, what we found at the EMP Museum was much more than we bargained for. We found a parking spot very near to the museum. There are actually 3 lots and all vary in price. If you arrive before 10am, the price is much more attractive for the whole day, so try to plan for that. On our walk to the EMP Museum we passed by the Ride the Ducks of Seattle tour. We had never been on one of those tours before and once in the museum I called up and booked for midday. This gave us a little under 2 hours to see the museum. Tickets are $20 per adult, children under 5 free and children 5 - 17 are $14. You can save $5 on adult tickets if you book online. And upon purchasing them we were told they could be used all day for re-entry so we were in no rush to see everything before our Duck tour. 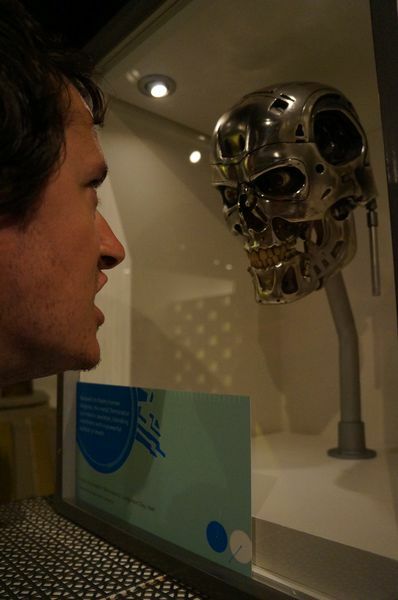 The EMP Museum is absolutely amazing. We could have spent all day in there. The first 2 hours went by very fast. The Fantasy section was my favourite. 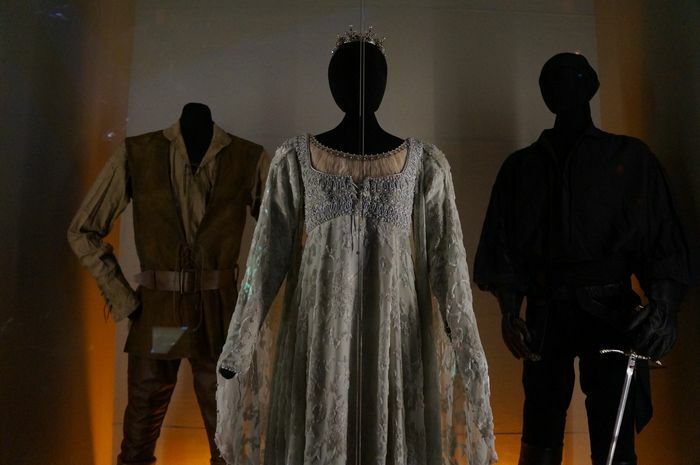 There were so many costumes and props from fantasy films and TV shows. 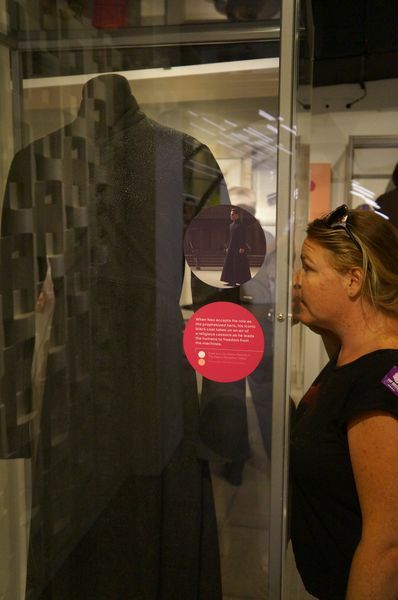 There was also a Science Fiction section with items like the coat the Neo wore in the Matrix or the Dylex robots from Doctor Who. And an absolute a fun exhibit for the kids involved a video camera and green screen so they could be a super hero flying in the sky. There were a myriad of touchscreen displays and even a science fiction reading corner with some classic tales. Near the Fantasy section down some stairs covered in screaming faces was the horror section. Josh stayed out with the kids while I did a quick tour of this M15 section. The exhibits included plenty of gore as well as interesting items from Aliens, and similar movies. However the history of horror was the most fascinating, with a wall covering some greats from Alfred Hitchcock, Jaws and more. Also on this main floor was a giant screen with lounges in front of it. It played music videos and the kids thoroughly enjoyed watching Michael Jackson’s Thriller come to life on a larger-than-life display. Upstairs (via lift or stairs) was a rock star performing room. We chose the name of our band - my kids decided on “TWB Monsters” - and then a song, my husband chose Wild Thing. We watched a small video explaining what happens and then they let us into the performance room. There were several microphones and musical instruments set up. Once everyone found a place they had a screen in front with a wild audience and the music started. We sang our way through the song and at the end we exited the room and watched our performance on a large TV. The kids loved it! 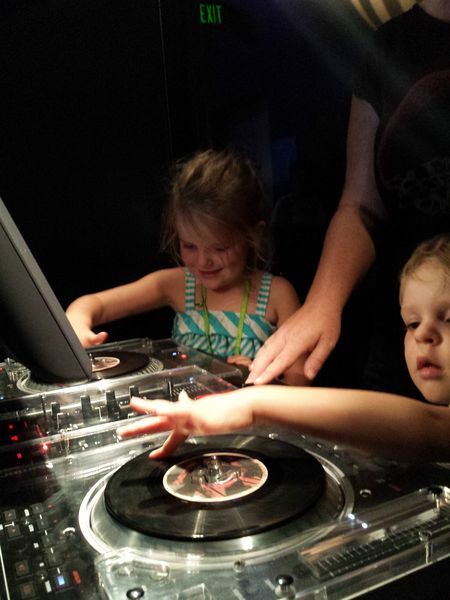 But by far our kids’ favourite section was The Sound Lab. This area is a musician’s dream. A wide range of instruments from guitars, drums, pianos, DJ equipment and more are set out for anyone of any age to play. Along the sides of the rooms were soundproof studios where you can jam out to your heart’s content or even book one to make your own CD. There is not much that can bring a family closer together then playing music concurrently (and even more so when everyone is in the same key). With a brief gap in the middle for our Ride the Ducks Tour, and then coming back later in the day, the kids just wanted to rock out and could not be pulled away when it was time to go. Josh enjoyed the Nirvana exhibit and the many guitars of Jimmy Hendrix. The actual building is shaped like a smashed guitar I am told; however to get that view you have to see it from the top. From a pedestrian point of you it is still a memorizing beautifully shape, with bold colours and textures, but also importantly, it is very well laid out. I cannot recommend this museum enough; it is a truly masterful creation brimming with creativity, a genuine piece of art that will enthrall the generations to come. Whatever you thought a “museum” was, this will blow that concept out of the water. When you are in Seattle, do yourself a favour and spend a whole day there. Perhaps next time TWB Monsters will get a live audience instead of a canned one? 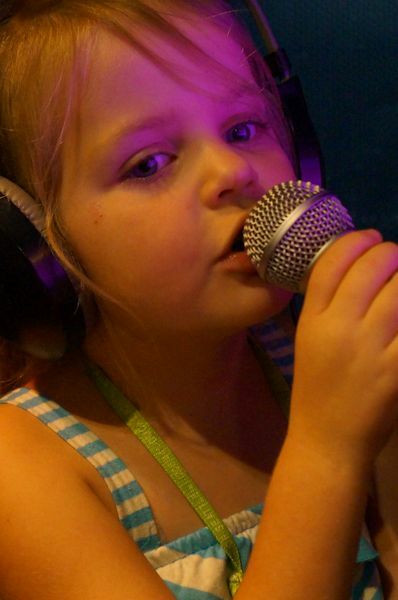 If you have any song requests, Mia is standing by. I enjoy your blog and wish I knew you were in my hometown. Seattle offers so many wonderful activities to do with many inside just in case you miss our 20 days of sunshine. I am glad to hear that you enjoyed your visit to the EMP. It is a wonderful place to spend the day. I love that this sounds so interactive! As a kid I remember wanting to touch all the things I could (I still do now of course, I'm just a bigger kid) but I think it made me more interested in the world around me and museums can be a big part of that. Love musuems! 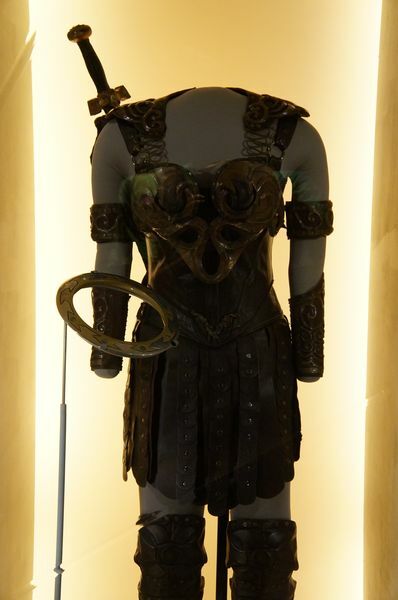 Is that a Xena costume I see?! AWESOME!!! !